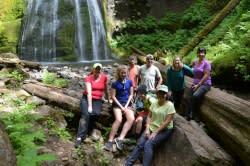 Exploring three waterfalls just outside Cottage Grove. 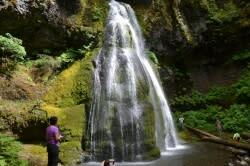 Oregon is rife with spectacular waterfalls, and in particular the Eugene, Cascades & Coast region has seven wonderful waterfalls that are popular destinations because of their beauty and accessibility. 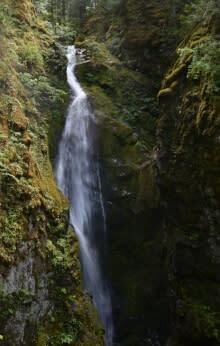 But today, we are seeking out three lesser known falls just outside of Cottage Grove in the Umpqua National Forest. A group of work colleagues assemble, all of us packing an array of cameras and notebooks, because, after all this is business – we work in tourism. Lucky us! Our first stop is the Cottage Grove Ranger Station where we pick up hiking maps and get a ranger briefing. 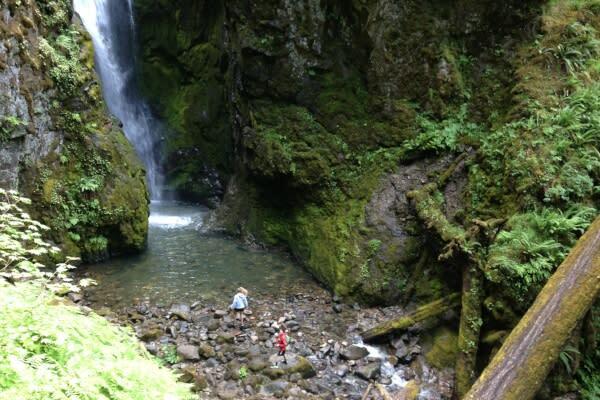 The “Thundering Waters” brochure produced by the Bureau of Land Management Roseburg District is an excellent guide with directions, waterfall descriptions and complementary information from how waterfalls are formed, to common plants and animals, to hiking safety. We are advised to be alert for the usual culprits – mosquitoes, ticks and poison oak. Armed with repellent, sunblock, water bottles and our picnic lunches, we set off to explore – a happy crew. A 28-mile (45 km) drive up a winding mountain road is the biggest hurtle. While not typically prone to car sickness, I do feel a bit queasy during the curvy ascent. Alighting from the car at the first trailhead, I breathe in the fresh air and quickly recover. I prepare to do battle with mosquitoes, but it turns out they aren’t particularly interested in me (not everyone in the group is so fortunate). First we are hiking to Moon Falls. 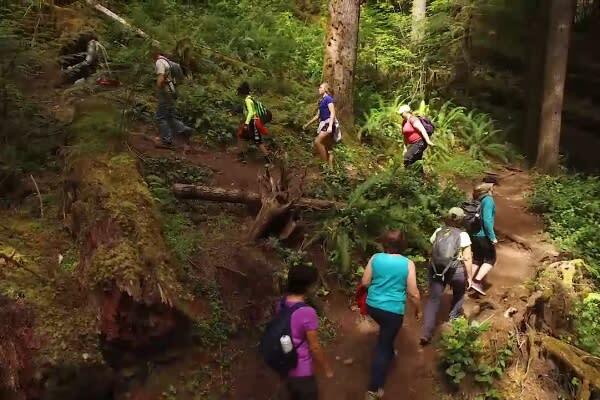 This is a short half mile (.8 km) hike rated “easy.” We file along the fern lined path under the bright tips of green fir trees. The mosquitoes seem content to stay at the trailhead and don’t bother us as we hike down. Moon Falls appears quickly with its glorious splashing and lacy spray. 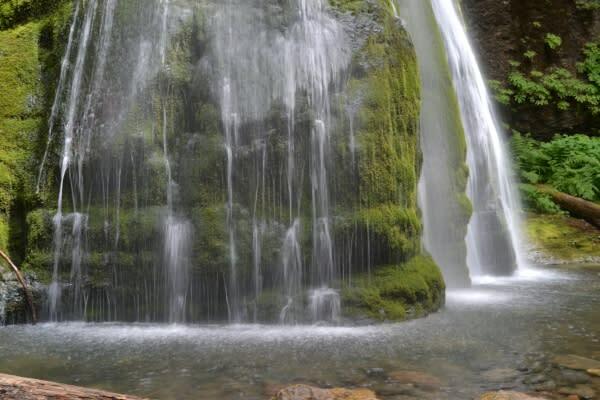 It streams over mossy rocks in a 125-foot (38 m) fan that drops into several small tiered pools. It is an elegant waterfall. Around the base we climb over rocks and logs to a shady picnic table. Several of us even hike up one side of the falls’ steep mud bank to get a closer look at one of the rock pools. The experience is invigorating and deeply satisfying. But now on to the next! 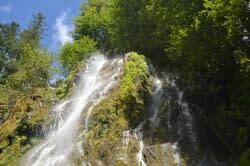 Pinard Falls is also about a half mile (.8 km) but rated “difficult” for its steep descent. Keeping my head down to watch my step, I discover the details of the forest. Peeking through the greenery are bright flowers – daisies, lilies – and little critters – caterpillars and slugs. I could just plunk myself down on the side of the path, observe the earth around me and be quite occupied. There is so much minutia to see. But I look up because I hear a roar. There it is – Pinard Falls. This tiered waterfall clamors down 105 feet (32 m) dramatically into one classic pool. Pinard Falls has wedged itself backward over time, cutting out a gnarly groove into the cliff. Trees cling precariously to the steep embankments and I marvel at their sheer will to thrive right there, growing straight and tall out of the side of boulders. A snarl of twisted fallen trees sprawl downstream from the waterfall’s pool, perhaps casualties of the fall’s relentless carving? It’s a bit of a scramble to get right down to the pool below, but I do it because of an inner nagging that if I haven’t touched the water, I haven’t arrived at my destination. I’m also inspired by the younger folk in our group whom manage to check out every crevice and look around every turn before I’ve even noticed the possibility. 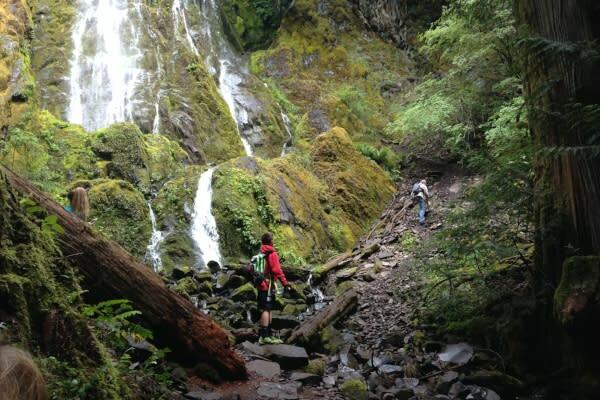 Visiting Pinard Falls, I feel a sense of accomplishment – “Look mom! See where I can go!” Check that waterfall off the list. We hike Spirit Falls last. It is back a few miles down the road and close to the clean pit toilets that we passed on our way up the mountain. At this point, the exercise and water-generated negative ions have charged our body batteries and we are all feeling a bit boisterous. Laughing and joking, we trundle down the “difficult” third-of-a-mile (.5 km) hiking trail on its switchbacks. And then, wow, we are ushered into what feels like a cathedral. 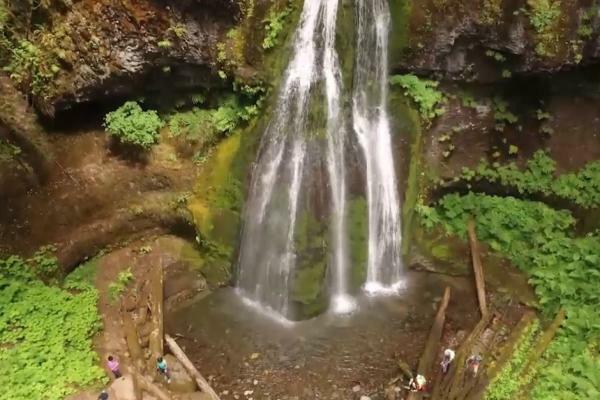 Spirit Falls is solemnly beautiful. Instead of raging and ragged, its water flows evenly over a rounded outcropping of rock into a gentle pool. A deliberately sculpted fountain couldn’t have mastered the graceful symmetry any better. With just a 60 foot (18 m) cascade, Spirit Falls in uniquely exquisite. Lush ferns and moss enshrine it. The group instinctively breaks apart, and instead we are individuals traipsing down to the foot of the falls on our own private pilgrimages. We sit still, quiet and reflective. In the presence of such power, I feel peace. I don’t think this waterfall got its name by accident. It is here, beneath Spirit Falls, that we have completed our day’s adventure – exploring three marvelous and different waterfalls. We briefly assemble for a group photo and then hike back to our cars with images and stories to share. But really, looking back – the only way to see these waterfalls, to really feel them, is to experience them yourself. I hope you are inspired to do so. Please note: The Layng Creek Watershed (including Moon, Pinard and Spirit Falls) serves as the municipal water supply for nearby communities. Please leave no trace, and keep the water and surrounding natural areas clean and free of debris and waste.